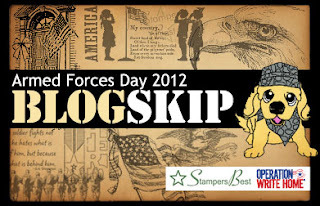 Welcome to Stampers Best OWH Blog Skip. I am happy to particpate in it. 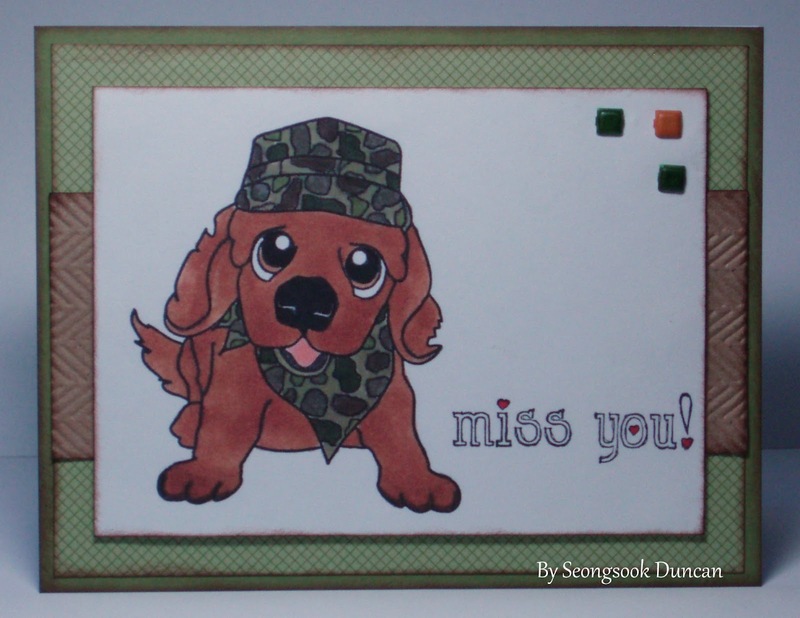 I have several stamp sets from Stampers Best. I am working on more cards to share with you. Here is the first one that I made for the start. 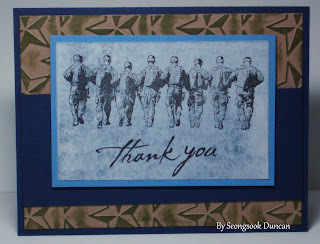 This stamp set is "Band of Brothers" rubber stamp. I embossed the background with "stars" embossin folder and inked by brayer. For the stamped image, I created a background cardstock by my "brayering off technique". I am getting so excited about this technique. I searched on the internet but I didn't see the same technique yet. Hope you will enjoy it. My second card. 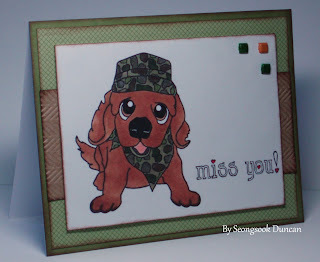 This is a stamp set designed by Sandy Allnock, "OWH Ciara in Camouflage Rubber Stamp﻿". I colored with Copics. I think that Ciara's color came out a little bit darker than real in this photo. 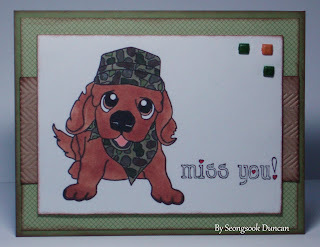 Sentiment stamp set "Miss You" is also from Stampers Best that I only stamped one part of it. Original sentiment is "I did 3 things today miss you, miss you, & miss you!" I like it all together but I didn't have enough space to stamp on. My third card. 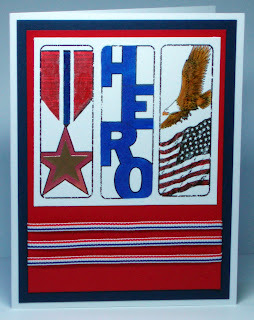 I used the stamp set "Hero Panels Rubber Stamp Set". I heat embossed the stamped image and colored with Copics. I draw pencil lines for the "HERO" word to show. I added a embossed star sticker on the big star. I think this is a great stamp set for the OWH cards. beautiful - thanks for your spport of Operation Write Home. Neat card! Love the image against the stars. Simple and beautiful. I love the brayering look. It really sets off the stars. I think that is my favorite stamp of theirs, I will have to purchase it this weekend! I would like to learn more about your breyering technique Seongsook. Fabulous card, Seongsook! I LOVE that technique and the Band of Brothers stamp is perfect for it! Thank you for sharing your talent with us. You are such an inspiration! I love the brayering on embossed stars. Great idea, thank you! Beautiful card! I love the breyering technique you used. The Band of Brothers image is perfect for your braying technique. Such a great effect and the kraft and blue combo is really nice too. Thanks for supporting OHW! This is amazing! 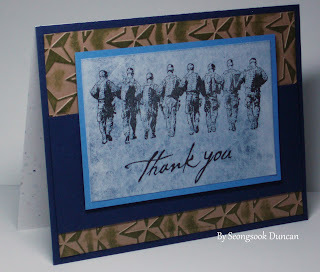 Love how you inked the embossing folder! Great card. I love the brayered look on the stars. What is your "brayering off" technique? Everyone wants to know that brayering technique - including me! Wonderful card, Seongsook! What a wonderful card, Love it! Love your cards. I am another person who would a tutorial of your brayering technique. Great cards! Ciara is pretty cute and I do like the Miss You. Hope you'll do an OWH tutorial with your brayering off technique! Great cards. Enjoy looking at your cards. Thanks for sharing. Your cards are always so nice, and I love how you did the background of stars! What a great look! Speaking of great looks - how 'bout Ciara wearing camo?! How cute is that!!! Hi Seongsook! Gorgeous cards! I must have that striking Band of Brothers stamp and I love those 3 little square brads that accent Ciara's camo. I am finding it so much fun to color that camo! 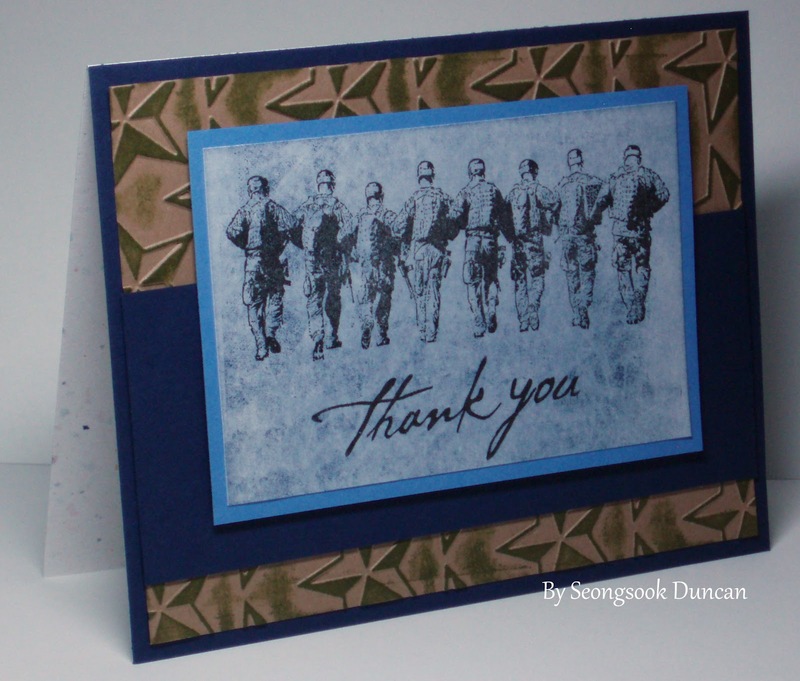 You make amazing cards, thanks for sharing your creations with OWH! Gorgeous cards. That brayering technique is so fun! Beautiful cards, Seongsook! I look forward to your technique tutorial, it sounds intriguing! Thanks for all you do for OWH! What a great set of cards! I'd be hard pressed to pick a favorite, they are all lovely. Thanks for all your support of OWH. I enjoyed all of your cards. I esp liked how you colored in the work Hero and outlined it on you last card. I think it really helps you to see the word hero. Seongsook, your cards are terrific! I love your first two cards with the brayer technique. The star embossing has a totally different look to it - I may have to buy a brayer! Great cards...will be stalking your blog to learn your brayering off technique :) Thanks so much for supporting OWH! Lovely cards. Love the embossed stars background. Your cards a gorgeous. I love how you colored Ciara. Can't wait to here how you do this brayer technique. Great cards, as always. I must try that brayering technique. It really makes the stars pop. I am always impressed with your cards and these are no exception! I love how the added lines to the HERO panels make the word POP. Thanks for supporting OWH. 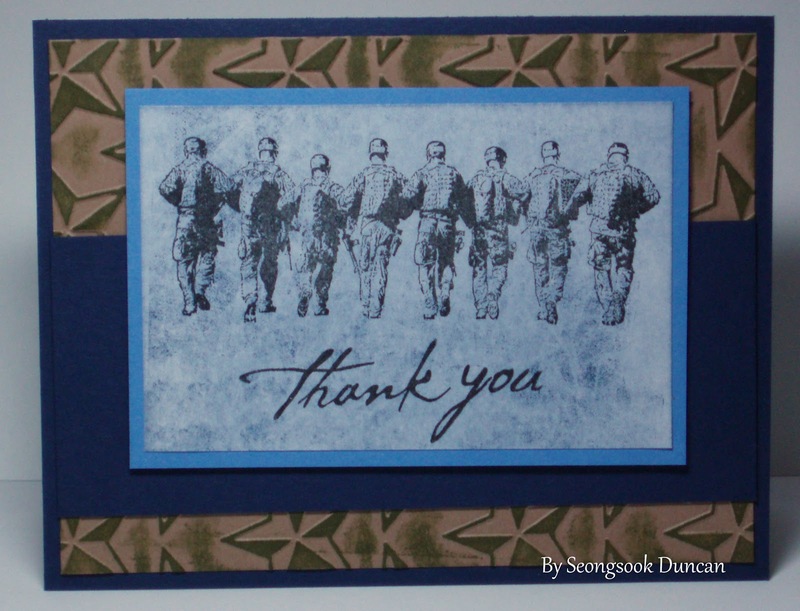 Thanks so much, Seongsook for creating these beautiful cards and for participating with us! I appreciate seeing the variety of OWH stamps, and how you used them to make three very different cards. Thans for sharing.